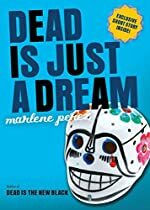 Dead Is Just a Dream by Marlene Perez. A Dead Is Novel. Review: What happens when a town and dark forces meet? In Dead is Just a Dream by Marlene Perez shows you what happens when just that occurs. There are seven other books in the series; anyone who likes this book would like to read the series. It takes place in Nightshade, a small town in Northern California, and Nightshade is full of supernatural activities. And in this book it is the Mara, a white figure that is giving people nightmares that scare them to death. And it is up to the viragos to stop them, the viragos are a group of people to protect the town from the supernatural occurrences. I suggest this book to anyone between the ages of nine and twelve. It has a creepy plot with a lot of action and full of fun. Dead Is Just a Dream is a quick read, entertaining, and just spooky enough to give you goose bumps. This book is filled with details, and very interesting. It's a great book right before Halloween. I loved the plot, loved the story line, and loved the characters. Easy read, quick read, and a whole lot of fun. We would like to thank Houghton Mifflin Harcourt for providing a copy of Dead Is Just a Dream for this review. Have you read Dead Is Just a Dream? How would you rate it?